The paper “Rapid and Sensitive Determination of Lipid Oxidation Using the Reagent Kit Based on Spectrophotometry (FOODLABfat System)“, written by the researchers of Seoul National University and Sungkyunkwan University in Republic of Korea and of Sanigen Co., Ltd., was published on Hindawi Publishing Corporation Journal of Chemistry on November 2016. 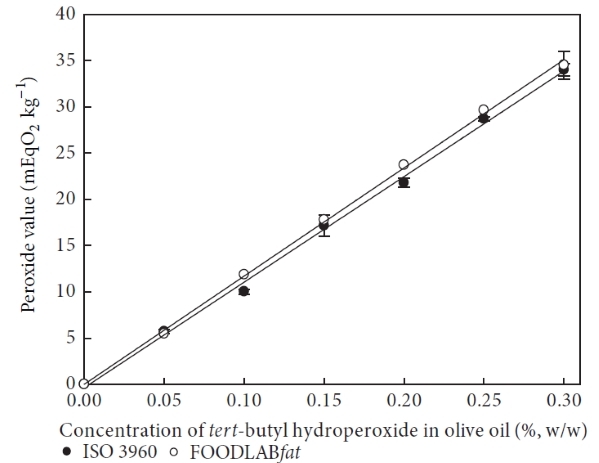 In the papar the researchers tested the reliability and availability of FOODLABfat system – old version of CDR FoodLab® for Oils and fats equipped with the same analysis methods – for determining free fatty acid value (FFA) and peroxide value (POV) during the hydrolytic rancidification and lipid oxidation of edible oils. CDR FoodLab® method base on photometric technology was compared to the official methods (ISO 660 and ISO 3960 protocols) based on manual titration employing the standard mixture for the simulated oxidation models and edible oils during the thermally induced oxidation at 180∘C. The experiments were conducted in triplicate, and the mean values and standard deviations are reported. The results from acid value and peroxide value were analyzed using Student’s 𝑡-test. All statistical analyses were accomplished using the SPSS software (version 20.0, IBM Corp., Armonk, NY, USA). They have established that the linear regression line of standard mixture and the significant difference of thermally oxidized time course study determined between them showed high correlations (𝑅2 =0.998 and 𝑝 < 0.05) in both FFAs and POVs. Considering ISO protocols with a probability of human error in manual titration. In the graph above you can see the comparison of Free Fatty Acids in the simulated oxidationmodel, determined according to the official method (ISO 660 protocol) and FFA reagent kit of CDR FoodLab®. In the graph above you can see the comparison of paeoxide value in the simulated oxidation model, determined according to the official method (ISO 3960 protocol) and POV reagent kit of CDR FoodLab®. Acid Value (FFA) and Peroxide Value (POV) obtained from CDR FoodLab® method showed good agreement with those obtained from the official methods. 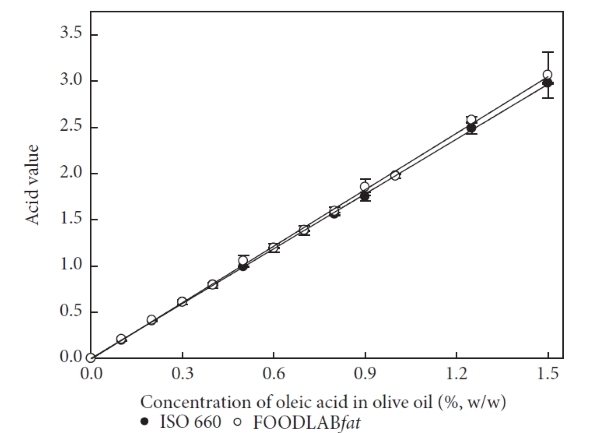 This analytical technique was validated to be reliable and reproducible for determining the oxidation degree of edible oils. Furthermore, it could provide many advantages compared with the official methods because of its rapidness, simplicity, and sensitivity. Validation study of Free Fatty Acids and Peroxide Value determination made by Universities in Republic of Korea was last modified: May 22nd, 2017 by CDR s.r.l.